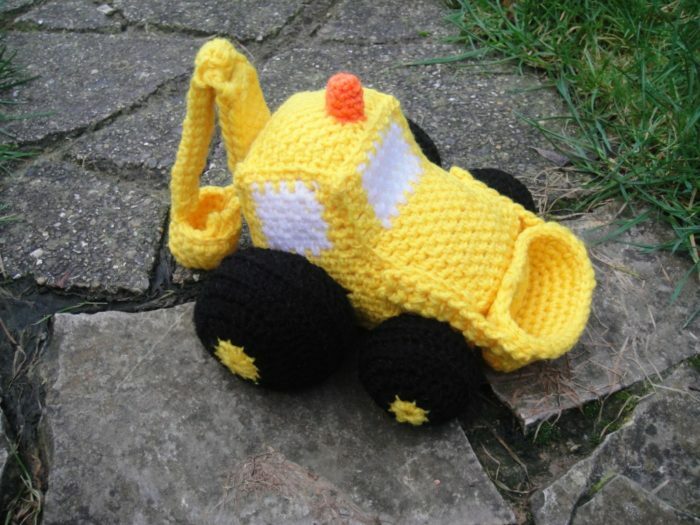 I might as well post the pattern for the Crochet Digger Loader here as I am never going to get around to doing anything about my Etsy account. Have at it, aspiring farm implement crocheters! Please Read Below Before You Download The Pattern! I have used US Crochet Terminology. The little light has been left out of the pattern, sorry! 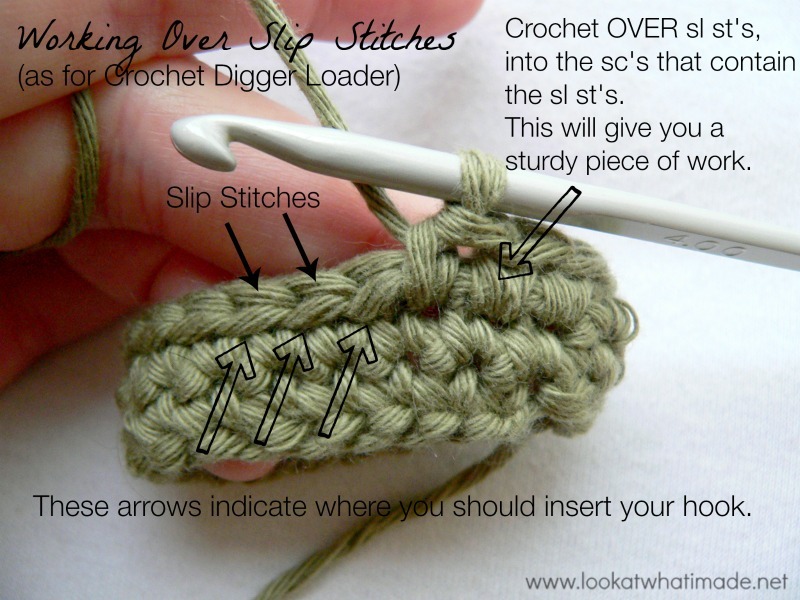 The crochet digger is made using the linen stitch, which is basically a mesh of *sc, ch-1, skip 1*. If you have never used the linen stitch, or would like a bit more help on how to make it, please see this photo tutorial. I have had some question about working over the slip stitches in this pattern (when making the “arms” and the “scoops/buckets”). Below I have included a photo that will hopefully clear up any confusion. Adding (and working over) slip stitches like this creates a very sturdy piece of work that will hold its shape much better. I hope you enjoy making this little digger loader. Hi, just to make you aware mtelpuk10862150 is selling your digger pattern on craftsy. Thank you so much for posting the excavator pattern. I made it out of embroidery thread for my 32 year old granddaughter who operates big machinery. She got tears in her eyes when she saw it. You are very clever to write such an easy to follow pattern. Many thanks. You are welcome, Gail. I would love to see your daughter’s excavator! Hi. I know everyone makes these for the grandchildren. I did too. They also make great items to donate to some cancer and burn centers that work with children. Done in cotton they can withstand many washing’s in the hospitals. Thank you so much for the crochet digger pattern, my 2 year old grandson is digger mad, I will be visiting him in November and he will love this! Dear Dedri! What do you think, is it possible to do this from cotton yarn? Hi Elena. It works really well with cotton! When I get round to doing this you are going to make my two year old grandson very happy! I’m stuck understanding how to do the big scoop/bucket…. It’s to do with the sl after doing sc…. I’m not sure the reason to do sl & what it should look like. Do you have any pictures that might help me please? Thank you very much. The main digger is all completed now! I hope my email tut helped you figure this out. On the digger pattern it says to attach the grill to the front but there is no grill pattern. Is it just the same as for the tractor? Thank you for your help. That is a typo, sorry Miriam. There is no grill (or lights) on the front of the digger. Just the front bucket. Thank you for bringing this to my attention. I started making this and I m stuck on the side raw 13. I don’t follow so if you can help me and clarify. Jyoti, you need to skip the first stitch and then sl st into each of the next 13 st’s (sc’s AND chains), not the first 13 clusters. This should bring you to the middle of the side section, where you will continue to make the 7 sc clusters that will form the window. Can I just ask, is this pattern written from UK or US terms? I love your cars and am about to make a few . How do I get the pattern for the digger please it is wonderful. thank you. All your stuff is beautiful. Thank you so much for this it’s fab! 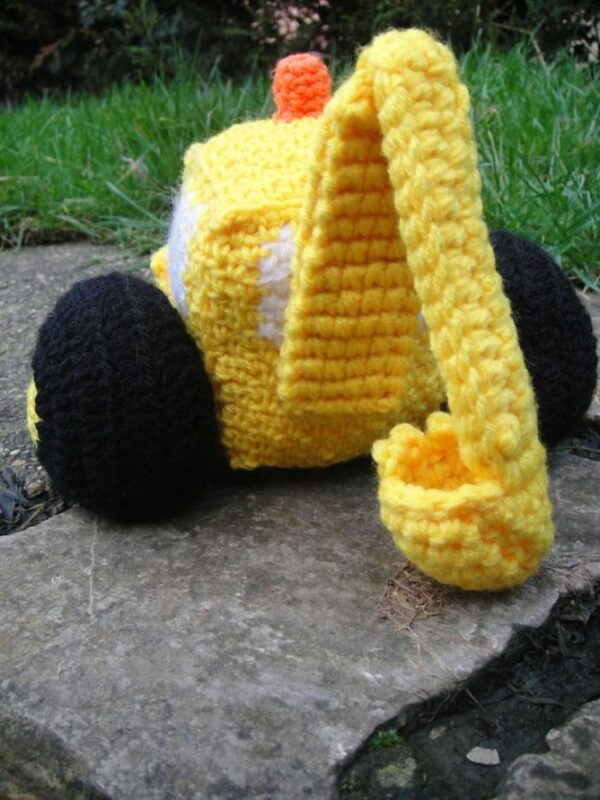 It’s nice to know that there are other people out there who also realise the need for crocheted diggers! I hope it’s OK that I’ve linked to this page from my blog. Thank you for the kind comment, Sarah. And thank you for the link as well. Of course there’s a need for crochet diggers, hehe. I’m curious to know if you found the pattern overly complicated or if it was ok. Take care and happy christmas crafting! Oh my goodness, how rude of me to have left it this long before replying! I thought everything was great about the pattern. It all made perfect sense to me.